Winds heralding another round of elections loom high. Astrologers, fortune-tellers, and every political soothsayer are busying themselves to make the kill. It’s that kind of season once again in Sri Lanka. The time to lubricate the palms big time if you’re someone or anyone endowed with the incomprehensible science of planetary movement. All of this can happen only in the resplendent island of Sri Lanka. Television channels compete with each other showcasing supposedly eligible and competent souls-of-clairvoyance confidently deciphering the science to the laity. Supposed god-men escorted to the palace in utmost secrecy for on-the-spot consultations. Those opting for greater accuracy venture the quick flight over the Palk-straits to consult professionals whose names have reached the “stars”. Government and opposition politicians alike engage in this kind of activities whenever elections come and even during non-election times. Whether you’re a product of Oxford, Harvard or a simple coward these rituals are considered sine-quo-none and are religiously observed. To add to the saga The Jathika Hela Urumaya an ultra-nationalist party in Sri Lanka recently told the Government and President Mahinda Rajapaksa to look at the holes on the ground before looking at the stars in the sky. It seems there is spell-binding pyrotechnics already embellishing the evening skies; this can only get pretty intense no sooner the election date is officially announced. This is not a Sri Lankan thing. Authentic and confirmed records have it that even President Ronald Reagan and his wife Nancy were firm believers in the esoteric science. So much for America’s faith in God and its near imperium on science. Prime Minister Mahinda Rajapaksa as the presidential nominee for the UPFA party at the 2005 Presidential election was not perceived as the frontrunner. Ranil Wicremesinghewas not considered the underdog either. It was this grey draping on the horizon that stumbled most political observers. The populist/ pragmatist dichotomy was in every voter’s mind. The slender thin majority Mahinda Rajapaksa won by bears true testimony. Mahinda Rajapaksa was also seen as an outsider, not comparable to the established tradition of seasoned campaigners who aspired for high office in mother Lanka. As the incumbent Prime Minister some prominence remained focussed on him but the position was purely ceremonial. His presidential credentials yet to be tested, demeanour evolving and a style of leadership left to the imagination. On the contrary his opponent Ranil Wicremesinghe had Executive experience, exposure and international standing. Ranil a member, an important one of the powerful Jayewardene government that achieved many a milestone in the socio-economic development in Sri Lanka. Not to mention Ranil’s short premiership immediately after the assassination of President Premadasa. Also his infamous stewardship as the Prime Minister during the presidency of Chandrika Bandaranaike Kumaranatunga. These factors redounded to the credit of Ranil Wicremesinghe. Polls indicated a close fight. Experts still reminisce the neck and neck fight. They adduce many reasons for the eventual result, chief among them being the forced boycott of the LTTE which tilted the balance in favor of Mahinda Rajapakse. One has to take cognisance of many written and unwritten rules to become President in a country like Sri Lanka. Prospective candidates put their heart and soul and work assiduously for the job, sprucing themselves and crisscrossing the country in the challenging campaign trail. Electioneering in Sri Lanka is tumultuous and turbulent. Your life is at stake. All this just to ensure your success. A little bit of research into the history of getting into politics and election preparation in Sri Lanka may unearth strange facts. Individuals had converted to other faiths wholly compatible with the constituency just to posture their eligibility. This bears testament to what extent hopefuls would go. This also bespeaks quite loudly the existential democracy with its many contortions. It’s irreparably skewed favouring Buddhists for the top spot. The minorities are constitutionally ostracised of ever becoming the leader of the nation. Sri Lanka is still to reach the desired level of sophistication to accommodate all. This elusive inclusiveness is still a huge and visible lacuna. Sri Lanka a nation endowed with many blessings and intimately called home by millions of Buddhists, Hindus, Muslims and Christians will never see a President or at least a Prime Minister emerge from the minority. This looks very unlikely, almost utopian. A Barack Hussein Obama may not emerge from Sri Lanka. His middle name for more reasons than one despised even in Sri Lanka. The prospect of a BBS invasion in a sea of vermillion red on the streets of Colombo cannot be ruled out if it was to become a reality by some stroke of a miracle. As for Prime Minister Mahinda Rajapaksa these weren’t issues at all in 2005. He had unique characteristics amenable to the audience. He had waited for this day and prepared well. His persona resonated well with the masses. It was his immaculate and inimitable nationalist aura that positioned him well, passionately championing the cause of Citizen Perera. Of late his brilliant rendition if not his unflinching jihad championing Buddhist causes had spectacularly outweighed any of his previous chivalrous efforts. It had catapulted him in rank and stature in some strategic quarters. It’s the Marketing genius in him that’s supremely admirable. Getting his SWOT analysis right and addressing them to the minutest detail. He doesn’t seem much concerned at the criticism that his actions may undermine democracy. He has absolutely no qualms in reaffirming his Buddhists credentials. He is no neo-liberal flaunting free enterprise and democracy, but a left leaning nationalist with fire brand rhetoric targeting concise, subtle and cogent messages to his target market. Very recently he said “the Diaspora wants a puppet at the helm” think for a moment the strategic implications of this statement vis a vis his target audience, an opposition in disarray and an impending presidential election. It will be quite insurmountable for the collective opposition to out-smart him. He’s always three steps ahead of the competition and marshalling his resources well. These strengths aided him well in 2010. Undoubtedly the catalyst was the defeat of the LTTE which earned him virtual regalia. Ordinary Buddhists bestowed a fitting sobriquet, they called him “King Mahinda. This truly emphasizes how deep his image had gravitated in the minds of the ordinary people. His chosen style and flamboyance utilizing a repertoire of genres available in the nationalist showroom is another achievement. He works very hard to augment his product. Any entrepreneur knows only too well what it means to get his product stand out, stay different, be identified and remain above the competition. Whoever coached Mahinda Rajapaksa had done an excellent job. It never let him down. He had perfected the process and put to good use. The maroon shawl can only be associated with the Rajapaksa’s and was suddenly ubiquitous by courtesy of the electronic and on-line media alike. It defies contemporary fashion for a rugged and handsome guy like Namal Rajapaksa, the President’s elder son to studiously emulate his father in dress code. He could easily walk into any one of the many Hameedia’s showrooms in town and come out with trendy, glitzy attire. But wait a minute; he knows as much as I do psychological intrusion and branding synergies cannot be sacrificed for the sake of the mundane. He’s in for the long haul. He’s indeed the chip of the old block, meticulous in both style and substance. The unfavorable caricatures of history are replete with nebulous and nefarious innuendos as to the exact antecedents preceding his enthronement. Who cares! He’s now the president of Sri Lanka and the de facto ruler- the jockey on the horse. His election to high office was unprecedented from many fronts. He was neither a Senanayake, nor a Bandaranaike nor was he a Premadasa. Usually a prestigious family name is seen as an asset and can be useful in starting or ascending an ambitious political career. This has been the norm in South Asia but not for Mahinda Rajapaksa. It was gut Determination, Strategic Positioning and an unshakable will to win. If his candidacy was to be compared to a product it certainly had glowing attributes at every strategic level. He was not a consensus candidate, his opponents were many. How he managed to get the numbers is history now. Winning the war in 2009 consolidated and cemented President Mahinda Rajapaksa’s position. This epic enterprise earned him near immortality and celluloid stardom. He achieved the unachievable. At a time when the nation had become insecure and despondent with little or no hope, he provided the required leadership to change things around. None of these constitute an exaggeration in any way or form. His leadership was instrumental in extricating the nation from the abyss of war and carnage that Sri Lanka had fallen into. Expectations rose astronomically in post-war Sri Lanka. Naturally the citizenry were extremely hopeful of a new start. A new era filled with peace, happiness and prosperity for all citizens, Buddhists, Hindus, Muslims and Christians. A near thirty year of destruction and devastation had come to an end. There was a natural desire in the hearts of every citizen to recoup, individually and collectively. Those who were teenagers in the eighties and nineties had become fathers and mothers and were nostalgic of what they had lost, not to mention those gory days when human body parts would dangle from trees tops. Shattered rail compartments littering the ocean shore. Burnt automobiles filling the urban landscape. These were scary times and even scarier to be a teenager. The consolation their children would not go through the same dark period was a great reassurance. People especially the minorities thought a healthy atmosphere had been restored, a new and celebratory dawn would rise with hope, peace and prosperity for all Sri Lankans. This feeling was mutual, this feeling was palpable. With all these pregnant expectations came the stinging and malevolent undercurrent. The thud that paralysed the minorities. Without any prior warning came the minority bashing. 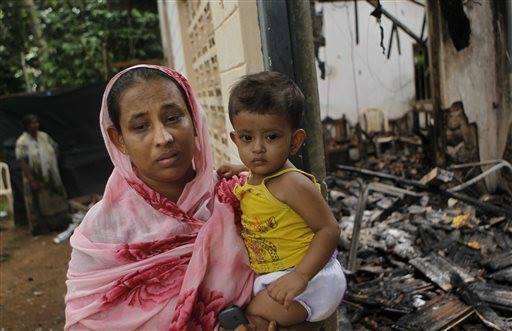 Christians and Muslims were targeted, their places of worship attacked and vandalised. Muslims in addition to being mercilessly attacked by the LTTE were in for their second innings. “The curtain came down in the northern theatre and had just begun to unfold in the southern”. This is how an elderly Muslim put it, trying valiantly to conceal his anxiety. He further said “A great way to pay tribute to a people who were doggedly unwilling to be treacherous”. A people committed to plurality and peaceful co-existence. The militant and monstrous outfit called the Buddhist Bodu Bala Sena or BBS with considerable state patronage had started a campaign of systematically demonizing the muslims. They were relentless and inflicted fear in the hearts of the Muslims. They campaigned hard against fundamental rights enjoyed by the Muslims for centuries. It started with the Halal issue then came the near indiscriminate attacks on Mosques and Muslims and in some cases killing them. Revisiting Aluthgamais a painful experience. Innocent people lost lives, valuables and their houses. A retired English teacher recounted how the mob systematically destroyed her house. She was able to identify a few of her own students in the gang. The arrival of Burma’s radical hard-line Ashin Wirathu who was instrumental in fuelling the killing rampage of Rohinga Muslims in Burma. Getting the monk down was an archaic strategy to intimidate Muslims and initiate a campaign of mind control. Politicians may employ unorthodox methods to carve, weed-out and secure their political geography, demography and psychography for their own parochial ends. These adventures though democracy enabled not consistent with prevailing laws. Democracy a colonial left-over continues to get diluted. Its practise always fraught with violence. Public administration depended on the person and not the process. Most institutions malleable. The law enforcing apparatus reduced to mere by-standers, emasculated and made appendages of the administration. The need for independent institutions further heightened. A life or two is a small price to pay. This is not healthy for the nation. The tacit collaboration of the government with the BBS is very frightening indeed. This kind of democracy is deceptive, distortive and destructive. It can drown us all. Lives are turned to mere numbers calculated, deleted, re-added and stored in data-drives for the future. The electorate is intelligent and informed and certainly not immature. Values are crumbling like old paint peeling off walls. We all know of the “San Francisco Peace Treaty’’ signed between Japan and part of the Allied Powers, officially signed by 48 nations on September 8, 1951, in San Francisco, United States. This was a monumental day for Sri Lanka then Ceylon. A major player in providing support for a post-war free Japan was the delegation from Ceylon. While many were reluctant to allow a free Japan capable of aggressive action and insisted that the terms of surrender should be rigidly enforced in an attempt to break the spirit of the Japanese nation, the Ceylonese Finance Minister J.R. Jayewardene spoke in defence for a free Japan. He further said “We do not intend to do so for we believe in the words of the Great Teacher [Buddha] whose message has ennobled the lives of countless millions in Asia, that ‘hatred ceases not by hatred but by love’.” He ended the same speech by saying “This treaty is as magnanimous as it is just to a defeated foe”. How can this version of Buddhism be juxtaposed with the kind of barbarism unleashed by BBS and the enactment of plain murder in Burma? This is a pernicious Buddhist ideology that has evolved to a monster in Sri Lanka, this does not auger well for the country. In the Muslim world too its leaders are grappling with issues pertaining to terrorism. They have no regard for human life and hell bent on being faithful to their warped ideology. Islam is not ideology but revelation that was brought down to the final Messenger. The authentic scriptures are intact even today 1436 years. Muslims well versed in the scriptures never condone terrorism, it is to be condemned unequivocally. The Buddhist clergy are people naturally prone to peace. They are the custodians of a great philosophy whose fundamental teachings revolve round peace, love, equanimity and detachment. They should not allow extremists to hijack their religion. Islam is also a religion of love and peace. Islam does not teach people to kill all those who disagree with them. If certain bigoted Muslims did so that is not the fault of Islam. How unjust would it be to say that Christianity is a religion that teaches violence and bloodshed by looking at historical performance of some so-called Christians: After all, Hitler who committed genocide against the Jews, the white supremacists in America who practiced barbarities against the blacks, the Serbs who committed genocide against the Muslims in Bosnia, those who systematically practiced mass slaughter of Muslims and Jews in Spain, and burned heretics, etc. all claimed to be Christians. What about the Christian killings in Ireland? So why use double standards in judging Islam? Stereotyping is wrong regardless of against whom we use it. What’s outwardly visible of Islam is its obedient adherence by both male and female Muslims. The female Muslim observes the divine dress code and should be allowed to go about her business without any hindrance. What Muslims can and cannot do is not decided by them but Allah. “And I (Allah) created not the jinn’s and humans except they should worship Me (Alone)” Al Quran 51:56. Sticking to Halal dietary habits, observing the correct Islamic dress code, not partaking in usury (interest) and many more are supreme acts of worship in Islam. So will you find fault and get physical and even kill a people just because they worship their Creator and strictly observe a way of life fashioned by Him? Where is your democracy for the Muslims? Aren’t they free to adhere to their religion practised by 1.8 billion people in the world? Doesn’t democracy encompass and protect Muslims in the Democratic, Socialist, and Republic of Sri Lanka? Finally on this issue I wish to draw the readers attention to a very pertinent verse in the Quran which will shatter all smoke screens Allah the Almighty says “It is not fitting for a Believer, man or woman, when a matter has been decided by Allah and His Messenger to have any option about their decision: if any one disobeys Allah and His Messenger, he is indeed on a clearly wrong Path” Al Quran 33:36. Apportioning blame on Islam and Muslims for the apparent rise in terrorism and terrorist threats in the world especially in the west is at the heart of a strategy developed by vested individuals and groups whose systemic and well choreographed attacks, borne out of either ignorance, hatred or just the thrill to demonize constitute an excruciatingly painful reality of Islamophobia. A sensible, enlightened and well endowed Muslim will assert patience and restraint as its the thing right to do. Muslims have countless hotspots in the world. Western sponsored massacres of Muslims persist unabated. Palestine has become a veritable scoreboard which ticks every three years or so with a horrendous score reflecting deaths of children, women, and men alike. The perpetrators of these heinous crimes are the civilized democracies with an arsenal of diabolical weapons. These perpetrators are not labelled as terrorists but as patriots of a cultured civilization simply exercising their rights to live on stolen land. To whom can we complain these dastardly deeds? We haven’t mentioned the unarrestable haemorrhage in Iraq, Afghanistan, Pakistan, Yemen, Libya and counting. Also let the Muslims be mindful just because the Muslims are at the receiving end it does not warrant unsolicited heroes to respond and compound the already volatile situation. For sure this can only exacerbate the situation and trigger further bloodletting. We wish to advise Muslims prone to radicalism to exercise restraint. They should understand their actions can prove counter-productive. We could ill-afford to be unwise and emotional. The Qur’an says about the prohibition of murder, “Take not life, which Allah hath made sacred, except by way of justice and law: thus does He command you, that ye may learn wisdom” Al-An`am: 151. The council of Muslim scholars have relentlessly refuted and warned the Muslim nation against these terrorists. Saudi Arabia’s Grand Mufti, the much revered and respected scholar Sheikh Abdulaziz Al al-Sheikh Hafdahullah, has called fighting ISIL “a duty”. This is the kind of response that should be meted out to deal with terrorism or extremism. Sri Lanka should certainly know better because she knows all about terrorism. You cannot fight and mollycoddle terrorism at the same time. Terrorism is certainly not the exclusive prerogative or preserve of the Muslims. Even the so called civilised world has unleashed atrocious acts of terrorism. They have done it in the past, they are doing it now and they surely can do it in the future. The success of Islam and Muslims will never, ever be dependent on terrorism. It need not be, it never was and it never will. If any group thinks violence is a sanctioned methodology they’re sadly mistaken. Islam did not come for ethnic Muslims alone but to all mankind. How can something that came to all mankind be relegated and condemned? Islam is the Final message from the creator. Its persistent demonization is a worry and heartache for the true believer. Extremism is not just an issue for the west to deal; it’s an issue that must be addressed by all. Dragging these individuals to Guantanamo Bay, Abu Ghuraib and Bagram are nonsensically unworkable strategies. We want to solve the problem not aggravate it. A deviant ideology cannot be eradicated by meting out physical punishment. The arrogant west has lost the war on terror due to its singular focus. Coming back to the campaign trail, maintaining the peace and working towards the common prosperity of the people was indeed the difficult part. Just as when we thought that Mahinda Rajapaksa would effortlessly stretch his monumental victories to his advantage his popularity had begun to plummet thus putting into question his electoral invincibility. The results of the Uva Provincial Council quite revealing. It portends a big fight for the ruling party. In the same light it must be forcefully reiterated that President Mahinda Rajapaksa is a fighter. He can move things even single handedly. He is three times the politician people think he is. Highly adept, unimaginably shrewd with a profound understanding of his people. He knows what to do at situations like these. The Muslims also want to talk to him and extend their support to him. Let’s not forget he is the President for all Sri Lankans, Muslims have pressing and crucial issues concerning their freedoms and privations. The Muslims want an audience with the President. Many are the grievances of the Muslims and this may be an opportune moment for frank discussions. Suddenly it’s all about 2015. This time it’s going to be different than 2005 or 2010. The realities are stark. There is growing disenchantment and discontent in every stratum. Prices of essentials had sky-rocketed, rampant corruption and political manoeuvring the order of the day, no system of check and balance, national wealth wantonly usurped. Corruption no doubt was a contagion with a malignant strain. If figures shown by the opposition is anything to go by Ebola would certainly pale into insignificance. Salaries remained unrevised, Inflation is high, public spending very high and without any trace of accountability, Debt has hit the grand trillions. Minorities marginalised, mocked and maligned and prone to violence and death. Hard-line Buddhist extremism had increased leaps and bounds. Last but not least youth rebellion in universities continues unabated. Sociologically suicides had increased; mothers had committed suicide with their children. Its undeniable the ugly head of social contamination is insidiously creeping .Not the workings of the pre-dominant Buddhist populace who’re peaceful but a motley few who have an entrenched political agenda. Trust the enlightened Buddhist scholarship will rise to the occasion just the way Islamic scholars had done. The true apostle of Buddha is not in favor of the growing distortions. The extreme version of Buddhism is tarnishing its image. Usama bin Laden and ISIL are no mainstream representatives of Islam just as Hitler and Mussolini were no mainstream representatives of Christianity. These very names of terrorists have been indiscriminately used manipulated by the media to the advantage of a few to perpetuate an agenda. Today Muslims of Sri Lanka cannot conceal their anxiety anymore. Aren’t those who kill the innocent terrorists themselves? If marginalizing Muslims is a calculated electoral strategy, I am afraid it can only boomerang. The friendship that exists between the Sinhalese and Muslims at the grassroots is very strong; this friendship has survived from times spanning centuries. The Muslims co-existed in peace and never proved treacherous and never will. Once again our testimony is redundant here. Politicians may want to overlook this strong bond of unity but simple, ordinary people at the village level wouldn’t. Muslims have successfully integrated and proved over and over again that they’re not traitors. Our friendship and loyalty even with the ancient kings were in good stead. Any fool can goad a mob and occasion wanton destruction and pandemonium; this cannot be a substantive reason to undermine strong bonds. All mobs do the same in most democracies and this is unfortunate. Marginalizing any community constitutes a gross travesty of democracy. Democracy is supposed to fortify social cohesion and not encourage division, suppression, isolation and victimization. This kind of irresponsible behaviour and near lawlessness can precipitate irreparable social damage and an erosion of confidence. This will not auger well for a nation that’s targeting a whopping 2.5 million tourists to visit this beautiful land by 2016. Let’s get real for a moment and leave realpolitik behind. Surely Sri Lanka does not have a supremacist form of governance. The socio-political and economic contributions of the Muslims are deeply rooted. Turn any book on the subject and history will relate benign and romantic anecdotes. Muslims were made welcome in every area of this country. They were welcome in the Kandyan Kingdom. They were integrated into Kandyan society primarily by giving them duties which related to the King’s administration. They were made a part of the Madige Badda or Transport Department. They were allowed to trade in arecanut, which was a royal monopoly. The Muslims from Uva, which was near the saltrens, had to bring salt as part of their obligatory service. Muslims also functioned as weavers, tailors, barbers, and lapidarists .Muslims also functioned as physicians, and presumably they practised Unani medicine. Muslim physicians were the Gopala Moors of Gataberiya in the Kegalle District. The family traces its pedigree to a physician from Islamic Spain, whose descendants migrated to the Sind in Northern India, Another important function of the Muslims in the Kandyan Court, was that they acted as envoys to the King. One Muslim envoy had been sent to the Nawab of Carnatic. Another had been sent to Pondicherry soliciting French assistance against the Dutch. It’s doubly clear the close relations Muslims had with the establishment and the people. The Muslims of Sri Lanka are a creative people. They are proud of their country. The Muslims are adept at business. The Prophet of Islam (may Allah exalt his mention) was a merchant and an excellent one at it. Business comes to most Muslims quite naturally. There is a perception that majority of Muslims in Sri Lanka are pro UNP (United National Party). First and foremost it’s no one’s business to question the political affiliations of Muslims. It’s their inalienable right to vote or not to vote to a person or party. For what’s it worth let’s explore this perception in some detail. Muslims don’t have an unbridled loyalty for the UNP, such an idea is frivolous, dismissive if not utterly nonsensical. Certainly it’s the UNP that first liberalized the economy. This happened in the year 1977. We as Sri Lankans agree unless someone is amnesic that this was an unprecedented milestone in the history of the country. This shaped the commercial prowess of our great nation. This near economic revolution restored confidence in the markets and facilitated a major fillip for trade, the rest is history. When the UNP eventually lost power in 1994 it had ruled the country for almost 17 years. How do you expect a people not to like an economic system that benefited all and sundry? A market economy has greater chances of resilience and stability than a command economy practised prior to 1977 – this should be a no brainer to most. The Muslims of Sri Lanka supported pragmatic policies not didactic heresies. History has proven we did the right thing. We the Muslims will uphold and support anything that offers succour to all citizens. We have no blinded loyalty to any party but to pragmatics. Democracy can be perverted by Machiavellian politics and politicians. Democracy certainly takes count of heads but not weights. Every politician who embraces democracy is not a Lincoln or Kennedy. Today in majority government’s due process is disregarded with impunity; minority governments have a malaise of gridlock and impasse. This is the new order. This is bad for the people. It’s the current narrative in America, Sri Lanka and most countries in the world. In the United States of America the government comes to a screeching halt every year due to acrimonious gridlock on the debt ceiling. The eventual losers are the people. This is a monumental irony. Democracy was supposed to empower all people not disempower or impoverish them. Democracy needs sincere leaders but sincere leaders don’t need democracy. The ancient kings of Sri Lanka knew nothing about what our politicians know today of democracy or the lack of it. They never imposed undue restrictions on fundamental rights on minorities. They did not stifle the natural flow hence they were resoundingly more successful than there modern compatriots. This is the very essence of sincerity of purpose I wish to emphasize here. Simplicity radiates profundity, Complexity fraught with misery. People to people contact should be kept simple and the natural flow encouraged. In this case the minorities should be treated with respect, dignity and equality just the way it was during the days of monarchy. If treachery becomes manifest and covenant breached punishment should ensue. Even in breach the state should not shirk from justice, no excesses, no collective punishment, nothing extra- judicial. I wish to reiterate I would love to give my vote for a benevolent dictator than a self-professed democrat. It’s kind of a disgrace for the present Sri Lankan government to countenance situations where its own citizens have to constantly clamour and agitate for their fundamental rights so eloquently and lusciously enshrined in the constitution. It’s like the child crying for milk. The child is aware that the milk is there yet the mother deprives and denies the child milk. Isn’t this kind of mother an evil mother? Some of the rights currently under threat vis a vis Muslims of Sri Lanka are shown below encrypted in the acronym REAL. Assurance of the right to procreate sans being ridiculed or demonised. Let’s analyse each one of these in some amount of detail. To most Muslims in Sri Lanka and the world the right to worship their Lord is sacred and not-negotiable. A Muslim may endure extreme poverty for prolonged periods of time but won’t be able to pass a single day without worshipping his Lord. This is essentially the five daily prayers, men in the mosques and women in their homes. The right to practise ones religion is universal and rigorously protected by various international bodies. None-Muslims living in Muslim countries have the same right but wrongfully deprived in some countries by extremists. I don’t speak for extremists. Additionally religious infrastructure must keep pace with changes in the demography. This shouldn’t be a difficult thing to understand. Muslims never asked for a separate state in Sri Lanka but for their very basic rights. The other issue at hand is the female dress code. The female dress code was not designed by Calvin Klein but by the Lord of the Worlds, who is The Best of Designers. If the buxom Chinese tourist from Shanghai can walk with her bikini in the salubrious climes of Hikkaduwa why not the Sri Lankan citizen walk with her own dress in her own country? Isn’t this outrageously duplicitous? Secondly shouldn’t economic freedom be equal to all? This too is a very fundamental right presently under threat for the Muslims. Any citizen should be able to start a business anywhere in the country without the fear of damage or destruction from vandals or extremist organizations. Muslim businessman and industrialists alike suffered heavy damage at the hands of the BBS. This is very unfortunate. Most of the employees in these organizations were young, enterprising Sinhalese lads just keen in doing a job and earning a salary. We sincerely wish there will be no more attacks and all properties will be treated as sacred. Thirdly the issue of Procreation or having children has become another major issue. I simply cannot understand why this was allowed to go so long. His Excellency President Mahinda Rajapaksa is the proud father of three wonderful and handsome sons. How many Buddhists had even thought of following our President on this noble deed? Yes it is a very noble deed. We as Muslims firmly believe that children are a gift from Allah. Muslims do not look at financial sufficiency or security prior to having children. Their faith is integral and holistic; they’re fully aware that everything happens as per the will of Allah- The Creator of The Heavens and Earths. Since of late Muslims of Sri Lanka had to endure a lot of humiliation on account of this. A notable demagogue in the cabinet recently said that the Buddhists will not be the majority in Sri Lanka in another fifty years. For a start Muslims have no intention whatsoever to become the majority. However its quite puzzling how a responsible minister makes such statements and continues to repeat them at every strategic event? I consider it very important that rulers and ruling administrations make attempts to have some rudimentary understanding of minorities and their religious beliefs. This can bridge the knowledge gap. There is so much misunderstanding and misinformation about Islam people exploit , especially extremists like the BBS who concoct blatant lies just to have a swipe at Islam. They must understand and make note that Islam has forbidden celibacy (state of not being married), monasticism (life of monks & nuns) and castration (removal of the male glands) The final Messenger sent to all mankind just before the hour (may Allah exalt his mention ) made this very clear when he told those companions who were considering acetic forms of life: He emphatically said “I pray and I sleep; I fast and I break my fast; and I marry women. Whoever turns away from my way of life is not from me.” Allah said in His final message The Quran: “Kill not your children because of poverty – We provide sustenance for you and for them” (al-Anaam : 151) Hence mankind should never abort or kill their children out of fear of poverty. It is Allah who provides for them all. Finally the sanctity of life must be preserved at all times. The majority group has a legal, moral and ethical duty to protect the minorities throughout the country. This is an all-embracing duty of the government. In a multi-ethnic country like Sri Lanka elections are opportune moments to address issues and grievances. It’s the sincere wish of every Sri Lankan Muslim that these pressing issues are addressed once and for all and a firm resolution elicited. Many are the goals our motherland has set. Together we can do it. YES WE CAN.